HomeBlogWhy does Unwanted Hair Grow? Why does Unwanted Hair Grow? Excessive hair growth is a difficult part of life to manage. Some people are fortunate and are born with a minimal amount of body hair, while others are more prone to superfluous growth. There are many different medical conditions that cause unwanted hair to grow. Hypertrichosis is a condition that causes excessive hair to grow in places outside of the face, breasts, chest, or back. Covering a large portion of skin for a long period of time can trigger this condition. For example, if you wore a cast for a broken limb, the region that was covered will grow hair rapidly. Genetics are the key cause of hair growth. Most people have hair growth disorders passed down through genes from their parents. Obesity can also cause Hirsutism, which is a condition that describes excessive hair growth on the chin, upper lip, chest, or back. Superfluous hair is often considered culturally unacceptable and unattractive. 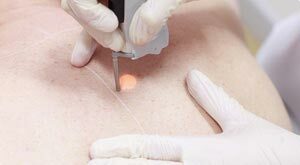 Many people who suffer from hair growth conditions use hair removal tactics, such as electrolysis, to manage the amount of hair on their body. Electrolysis is one of the more permanent options of hair removal. If your are interested in removing excess body hair, contact and specialist on electrolysis in Staten Island or Hair Removal in Staten Island.